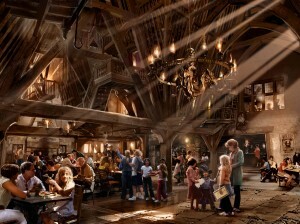 One of the newest Orlando theme park restaurants is the rustic tavern, Three Broomsticks, the official restaurant of Harry Potter and the Forbidden Journey located at Universal Orlando’s Islands of Adventure. It has already won runner-up in Orlando’s 13th annual Foodie Awards for Best Theme Park Restaurant. This is a counter service restaurant, rather than full-service dining. You order and pay at the counter and pick up your food at another counter, so reservations aren’t required. However, I understand they will take a reservation the breakfast deal, which is a complimentary breakfast when you book your trip with Universal. This is the place where you can dine on authentic British food and try the famous (non-alcoholic) Butterbeer. Butterbeer is a butterscotch, carmel-y cream soda topped with a buttery, frothy, creamy head and together they are decadent and delicious! You can also try the Pumpkin Juice, which is like liquid pumpkin pie, except not quite as sweet, but also wonderful and tasty! Also served here are rotisserie smoked chicken, fish and chips, shepherd’s pie, turkey legs, fresh veggies, and more. Of course, there is a children’s menu as well that includes kid favorites such as chicken fingers and macaroni and cheese. At the back of the Three Broomsticks tavern, is where you’ll find the Hog’s Head Pub, where adults can sample a great selection of beers, as well as wine, spirits, and mixed drinks. Although the food is very tasty, the atmosphere is the key ingredient to this place. It’s very charming and just what you imagine after reading the books. Make sure you watch the walls as you can sometimes see an owl flying by or catch a house elf walking around upstairs! You can choose to sit inside and enjoy the atmosphere or enjoy lakeside dining on the patio. Either way, it is a charming experience.